Can I tell you secret? Most people who visit Catalina Island miss out on the real magic of our Southern California destination. 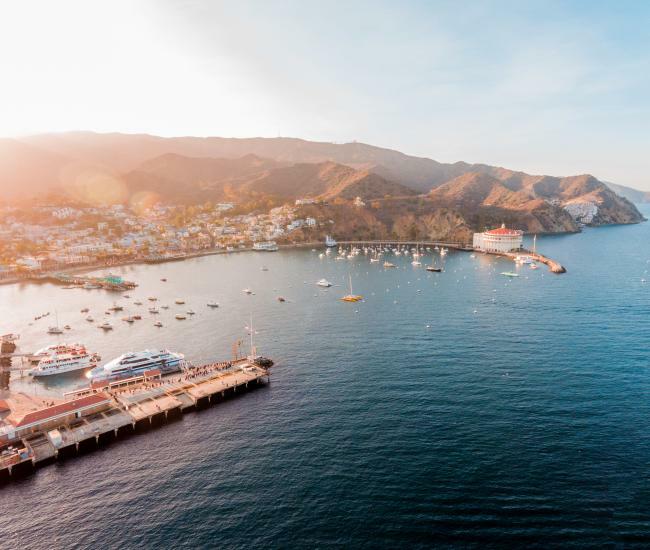 Even though the charming seaside village is just a tiny portion of the island, most visitors never venture beyond Avalon, which means they never get to experience the compelling confluence of isolated wilderness and spectacular scenery that is the Catalina backcountry. Thanks to the non-profit Catalina Island Conservancy, which owns nearly 90 percent of the island, the rest of the island is in stark contrast to the Southern California mainland. 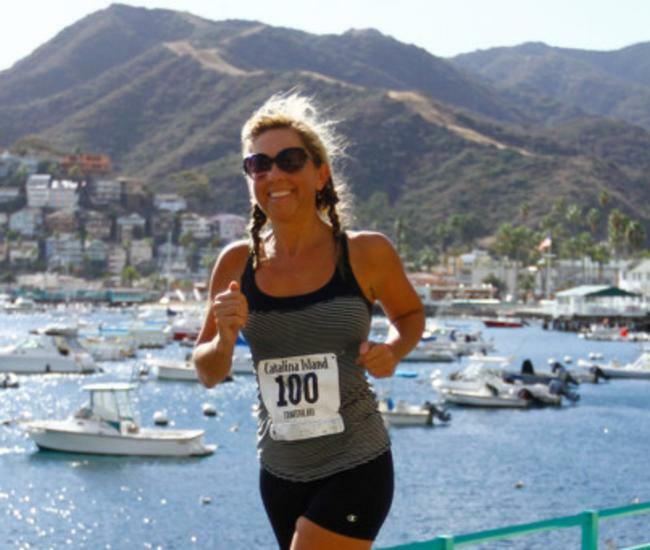 Rather than traffic-clogged freeways traversing endless strip malls and subdivisions, Santa Catalina Island sports fascinating creatures, spectacular vistas and unspoiled wilderness. Isolated from the mainland – and protected from its rampant development -- the island is a beacon for those looking to shake off the bounds of urban sprawl and truly reconnect with the wild places, where nature still rules and humans can be just a part of the landscape. Catalina’s nearly 76 square miles and 50+ miles of coastline harbor dramatic cliffs and peaceful meadows, unique wildlife and iconic creatures, as well as remote beaches where the only footprints will be your own. Here are three great Catalina Island hikes to get you started. This 38-mile trek along the spine of the island has earned a reputation as one of the most beautiful – and challenging – hikes in Southern California. Tackling the entire trail will take several days and is best undertaken when the weather is cooler. Plan on dramatic elevation changes and expect to be rewarded with awe-inspiring vistas that will become life-long memories. Starting at the Wrigley Memorial and Botanic Garden, this 1.2-mile hike should take just about an hour for most hikers. While it does have an elevation gain of 679 feet, this hike takes you along a dirt road and is moderately difficult. You’ll reach the summit and be rewarded with spectacular views. Have more time? Add the Garden to Sky Loop or the Lone Tree Spur, which allows you to see the Palisades, dramatic cliffs on the windward side of the island. Catalina’s Airport in the Sky, with its charming shop, delicious restaurant and interpretive displays, will be your base for this 2.2-mile loop. Plan on about an hour for this moderate hike that allows you to experience the soapstone quarry that native islanders used for generations to create both utilitarian implements and decorative items. The views aren’t too shabby either. Transportation from Avalon is available via the Wildlands Express Shuttle Service. Those Catalina hikes – and many more – are part of the extensive trail system currently being maintained and expanded by the Catalina Island Conservancy. Known as Trekking Catalina, the Conservancy’s 165 miles of trails offer visitors the opportunity to immerse themselves in the island, experiencing the wonder of the natural world and surrounding themselves with the spectacle of land meeting sea. Hiking on Catalina Island should be undertaken with preparation. Hikers are required to secure a free hiking permit from the Catalina Island Conservancy before venturing out into the interior. Wildlife, including North American bison, should only be observed from a respectful distance. 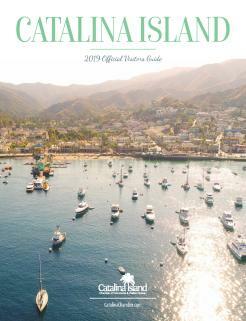 Trail maps and more information are available from the Catalina Island Conservancy. Catalina’s rugged wilderness has also become a beacon to mountain bikers, eager to challenge themselves on the island’s steep roads and jagged terrain. Mountain biking on Catalina Island requires a Freewheeler Bike Pass which is available at the Catalina Island Conservancy and includes a membership to the conservation organization. 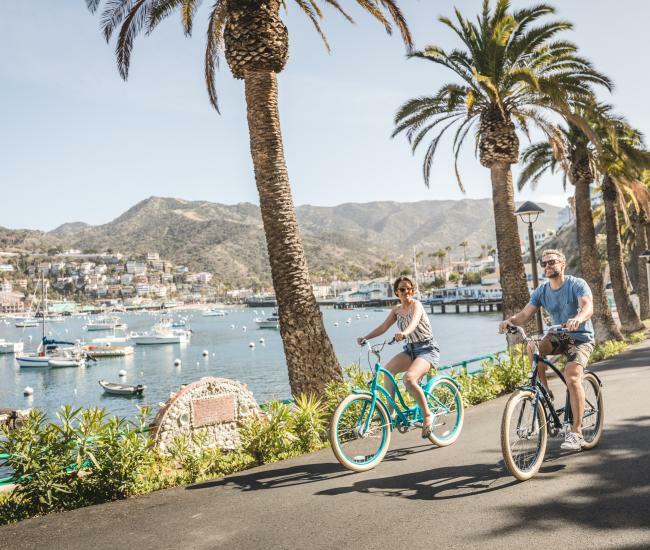 Riders can bring their own bikes to the island, arrange to rent a bike on Catalina through Browns Bikes or have a guided trail experience with BikeCatalina. If the allure of the island’s interior has you longing for more than just a hike, camping on Catalina Island is just a reservation away. The island offers several options, ranging from tent cabins in Avalon and at Two Harbors to more primitive options at Blackjack, high up in the island’s upper peaks, and at Little Harbor, a wide sand beach and meadow on the island’s windward side. Even more isolated Catalina camping is available on Catalina’s protected leeward coast. Dotted along the shore are a series of secluded coves and beaches that host primitive campsites accessible only by boat. These campsites can be reserved through the Catalina Island Company and – if you don’t have your own boat – can be reached via kayak. Catalina camping is available year round and reservations can be made online. No matter how you choose to enjoy Catalina’s interior, a little trail support is always appreciated, whether that means a bit of local advice or someone to set up camp before you arrive after a long day of hiking. Catalina Backcountry’s mission is showcasing the island’s interior to visitors with trail support, gear haul and naturalist-led hikes as well as advice, gear rental and custom itineraries. Legendary outfitter REI began offering guided expeditions on the TransCatalina Trail in 2017. Provided in concert with the Catalina Island Conservancy, these multi-day adventures include trail support, meals and transportation. For details on upcoming REI Catalina trips, sign up to receive the Conservancy’s newsletter. What are you waiting for? Catalina’s backcountry secret is just waiting to be discovered.